In the last fortnight, I fortuitously found myself twice in the vicinity of local “Half Price Books” stores. With plenty of time to browse, I made off like a bandit with a sizable haul, all for well under one hundred dollars. These treasures I will share with you, Dear Reader. From the clearance section I espied several interesting looking large books, and pulled them off the shelves. These have most of their value in imagery, artwork, or other visual appeal, and will remain on the living room coffee table. The New York Times: Page One: a book of about 200 front-cover pages of the NYT over the 20th century. Includes the obvious events – “JAPAN WARS ON US AND BRITAIN; MAKES SUDDEN ATTACK ON HAWAII”, but is also interesting for what ends up in the smaller headlines on those historic days. Columbus Vignettes: A two volume series of books containing skillful sketch illustrations of landmark buildings around the Columbus, Ohio area. In addition to the illustrations there are brief histories of the pictured buildings and anecdotes of local history. Most of the featured structures are now gone or so “renovated” as to be unrecognizable, so in some cases these sketches may be the only remaining images of them. Batman – Year One: This is a nice hardcover edition of Frank Miller’s rendition of the Batman origin story. I stumbled across a worn copy years ago, and it is still the only superhero comic I’ve actually read. Watchmen doesn’t count. It has a good, just dark enough storyline (that contributed heavily to the Batman Begins film), and dynamic artwork that makes good use of shadow, fittingly. Images of War – The Crimean War: Appears to be exactly what’s on the label – a photo book with numerous stills from the Crimean War (the one in the 1850s, not the more recent events). I’m looking forward to seeing some of the arms and equipment fielded by the armies in one of the first modern-era wars. I have an amateur interest in the field of intelligence/counterintelligence, as well as the history of such. I picked up a few related books in order to ████████████ and implement in ███████████ . Intelligence Warfare: This one looks like it’s going to be a mixed bag. It has graphics and text descriptions of the structure and function of different national intelligence agencies, and talks about cutting edge technology being used in the field of intelligence. However, the USSR was still holding fast the Iron Curtain in the time that said technology was cutting edge. Still, I’m sure it will provide some insight into the era and hopfully it has some perennial information about espionage/counterespionage. Spycatcher: Another Cold War book, but this one apparently caused quite a stir when it was released. It contains numerous allegations of incompetence and mischief on the part of the various British intelligence agencies, and the British government attempted to prevent its publication, successfully banning it from being sold in England. The Devil’s Chessboard: From descriptions online, either a masterpiece exposing the truth of the shadow government, or a propaganda piece full of conspiracy theory and conjecture. Alleges vast misconduct on the part of Alan Dulles and the CIA, up to and including orchestrating the Kennedy Assassination. Irish Myth, Legend, and Folklore: A wonderful compilation by Lady Augusta Gregory with W.B. Yeats accompanying. I’m familiar with a couple of the stories contained (such as the saga of Cuchulain) but it has plenty of tales new to me. I greatly enjoy European folklore, especially that of the Celts, so this was a good find. The Sword of the Lictor: I am in the process of collecting hardcover volumes of the Book of the New Sun series by Gene Wolfe, and with this I have 3/4 of them. It is my favorite work of fiction that I have read. Someday I will try to write about it if I think I can do it justice. Litany of the Long Sun: Another fantastic Gene Wolfe book set in the New Sun universe, and another I have already read. I possess the e-book version but when I saw the hardcover on the shelf didn’t have to think hard about picking it up. Castle of Days: More Gene Wolfe, but this one new to me. It looks like a collection of short stories, which I usually enjoy. Short stories are great for the opportunity to experiment with an idea, and to either flesh out an existing fictional world, or simply create a small new one. Steve Jackson’s Illuminati: When I saw this one on the shelf I grabbed it immediately. 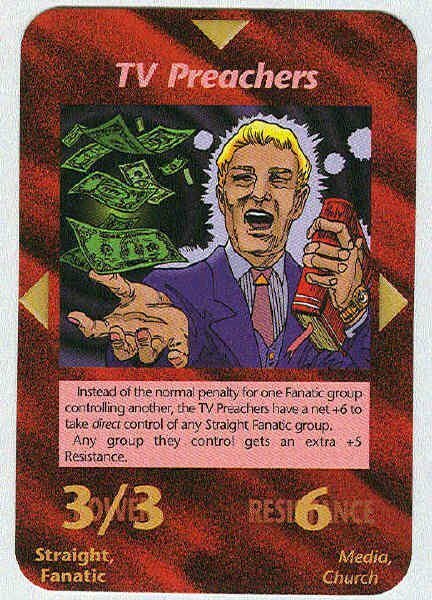 I had seen pictures of some of the extremely entertaining cards online before, such as “Flat Earthers“, “TV Preachers“, and of course “Hitler’s Brain“. Unfortunately this version does not contain the infamous Terrorist Nuke and Pentagon cards, which apparently predicted the 9/11 attacks years ahead of time. We tried actually playing the game once so far, but it was kind of clunky to keep track of things. I would certainly encourage anyone who hasn’t been before to make a trip to a nearby used bookstore if you’ve got an hour or so to spare. The ordering of books will likely be somewhat chaotic even if it is supposedly organized alphabetically, so take your time looking. Clearance is great, that large New York Times cover book above was only three dollars on the clearance shelf. If you’re like me you’ve got a sizable stack of books on your to-read list, what’s a few more? Tagged Books, bookstore, Counterintelligence, Fiction, Gene Wolfe, Illuminati, Intelligence, used books.